BEIJING — There’s one leader who may be pleased that the President Trump’s planned summit meeting with Kim Jong-un appears to be on the rocks: China’s president, Xi Jinping. Analysts in China and the United States say that Mr. Xi is probably nervous about the North Korean leader’s getting too close to the Americans, particularly given Mr. Kim’s independent streak and past willingness to buck China. But a delay in the meeting also benefits Mr. Xi, who could use his influence with North Korea as leverage while China negotiates a trade deal with Washington. The recent burst of harsh tirades from Pyongyang seems to have caught Mr. Trump by surprise. Frustrated, he took aim at China, suggesting that North Korea started toughening its accommodating tone only after a surprise meeting between Mr. Kim and Mr. Xi in the Chinese port city of Dalian two weeks ago. But analysts also said that they thought Mr. Trump was misreading the situation, and that the pushback probably stemmed more from North Korea’s concern about its own survival than from interference by Mr. Xi. The confusion and finger-pointing show just how complex the situation is, with multiple actors negotiating in multiple channels with myriad and sometimes overlapping agendas. Mr. Trump suggested that the Chinese president had egged on the younger and less experienced Mr. Kim in taking a harder line, possibly to strengthen China’s own hand in trade talks with the United States. Mr. Trump also called Mr. Xi a “world-class poker player,” a backhanded compliment for a world leader whom Mr. Trump has called a friend and a partner in enforcing international sanctions on the North over its nuclear weapons program. While it is not known what the North Korean and Chinese leaders discussed during their meeting in Dalian, Mr. Xi was probably pushing his own agenda, such as economic cooperation, and advising Mr. Kim on dealing with Mr. Trump. Chinese analysts say China has much to gain from a peace deal that would prevent a potentially disastrous conflict with the United States on its border, and that in the long run might result in the removal of American troops from South Korea. Many American analysts agreed, saying the North’s recent harsher tone reflected the Kim regime’s concerns about its own survival, and its bedrock belief that it needs to keep some form of a nuclear arsenal. “Blaming the Chinese for the change in tone from North Korea strikes me as trying to find a Chinese scapegoat for a summit failure,” said Douglas H. Paal, vice president at the Carnegie Endowment for International Peace. However, some American analysts said China had an interest in at least slowing down any rapprochement between the United States and North Korea. The United States, by pressuring China on trade just as it is relying on Beijing to help bring the North to the bargaining table, has created an opening for Mr. Xi to use the talks with North Korea to force the Americans to make concessions on economic issues. 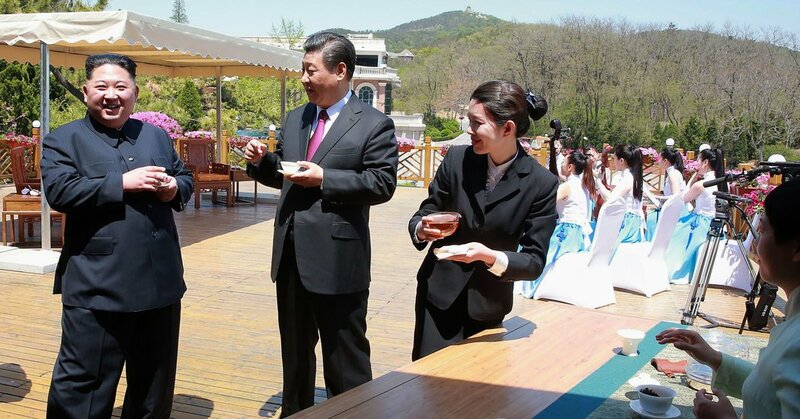 During their meeting in Dalian, Mr. Kim and Mr. Xi exhibited an uncharacteristic bonhomie, strolling together on a beach and chatting informally. This was a dramatic change from the first six years of Mr. Kim’s rule, when ties with China were frosty, and even his first meeting with Mr. Xi in Beijing in March, when the North Korean leader appeared stiff and wary. In their communiqué after the Dalian meeting, China and North Korea called for a slow, phased process of disarmament for the North, rather than the rapid scrapping of its weapons, as the United States has demanded (although Mr. Trump suggested Wednesday he was now open to a phased dismantling of the North’s nuclear program). Since the meeting, Chinese officials have been telling foreign diplomats that Mr. Xi and Mr. Kim discussed how the young leader should deal with Mr. Trump. Mr. Xi, who is something of a globe-trotter, has met Mr. Trump several times; Mr. Kim has met no other world leaders besides Mr. Xi and Mr. Moon, getting together with the South Korean leader in a dramatic encounter at their countries’ joint border last month. However, just after the Dalian meeting North Korea seemed to back away from its earlier statement that it would consider complete denuclearization of the Korean Peninsula. During a trip to Pyongyang days later, Secretary of State Mike Pompeo hoped to get additional pledges from the North on scrapping its nuclear program but did not. Significantly, the threat was issued by the North’s chief nuclear negotiator, Kim Kye-kwan, a veteran of the North’s foreign ministry who is well known to Washington. His statement took specific aim at John R. Bolton, Mr. Trump’s national security adviser, who had said on a Sunday television show that North Korea needed to dispose of its nuclear weapons program quickly, following what he called the model of Libya under Col. Muammar el-Qaddafi. Chinese analysts say North Korea’s elite see Libya, and Mr. Qaddafi’s inability to subsequently defend himself when Western powers backed the popular uprising that toppled him, as a warning not to give up nuclear weapons. They said it was Mr. Bolton’s impolitic comments, and not behind-the-scenes Chinese machinations, that hardened North Korean attitudes. “Subverting the summit would bring even bigger uncertainties to China,” said Shi Yinhong, professor of international relations at Renmin University in Beijing. Mr. Shi said China would benefit from easing tensions on the peninsula, with a lifting of sanctions allowing a resumption of trade along its shared border with the North. In fact, he said Mr. Xi probably used the Dalian meeting to entice Mr. Kim with expanded economic ties to help Mr. Kim fulfill his promise to his own people to fix the North’s dilapidated economy. Mr. Trump himself has often linked North Korea and trade, telling the Chinese that he would give them a better deal on the latter if they cooperated on North Korea, said Bonnie Glaser, a China expert at the Center for Strategic and International Studies in Washington. Some analysts said this was apparent in the Trump administration’s handling of ZTE, the Chinese telecommunications equipment company that the United States barred from buying American-made parts as punishment for its dealings with North Korea and Iran, threatening the company’s survival. “There was a belated recognition that the trade agenda was complicating Trump’s ability to achieve progress on his top priority of North Korea,” said Ryan Hass, a fellow at the Brookings Institution, and a former member of President Barack Obama’s National Security Council. He said the Trump administration was now gambling that showing flexibility on trade would persuade Beijing to cooperate on North Korea. “Time will tell if that bet pays off,” he said.